The Hat House in SoHo, NYC is one of the best hat shops in NYC according to the current article on best hat shops by the CBS local website. 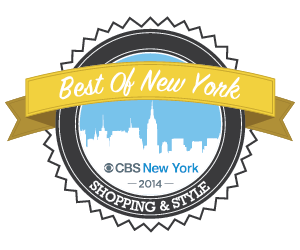 We were awarded their "Best of New York - Shopping & Style designation for Best Hat Shop NY. We look forward to having you purchase your hats at our hat shop located at 131 Thompson Street, between Houston and Prince Street. Customer service is very important to us and helping you find just the right hat to fit your style as well as actually fitting your new hat properly is our goal. Our hat selection is for both men and women. We have beautiful hats that you can purchase right off our shelves as well as our custom made hats that are built to conform to your exact headsize and shape. Our specialty is making bespoke handmade fedoras and western hats made of the best quality rabbit, wild hare and beaver fur felts. The Hat House also has a private stash of fino and superfino Montecristi Panama Hats that are simply the finest hats available. These are built and conformed to your headsize and shape. They are the luxurious and are great for both informal relaxed times as well as more formal occasions. Visit us today, we are conveniently located in Soho NYC near most of the subways and there is on street parking.